It's no coincidence that Remedy Entertainment's upcoming third-person shooter is named Control. The theme of control is a constant: Humanity's wish to control our environment, unseen organizations controlling our destiny, even powers of mind control that our hero Jesse Faden can eventually harness. And now I can add another one to the list: Holding a DualShock 4 controller and getting some hands-on with Remedy's latest. Now that I've fired Jesse's morphing Service Weapon for lethal effect and taken down possessed enemies with supernatural powers, I'm even more excited to play Control in full – but maybe less so for its combat. For a game all about facing the existential terror of the unknown, Control's core elements have already been well documented since its debut at E3 2018. There's the blocky brutalist architecture of the ever-shifting setting known as The Oldest House; Metroidvania-style progression with side quests and secrets galore; Echoes of the 'new weird' genre that birthed books like Annihilation; Clear inspirations from the collaborative fiction of the eerie SCP Foundation. While we still don't know much about her past, we've seen many of Jesse's uncanny abilities in action, as she levitates through the air, uproots concrete to shield herself from bullets, and throws furniture all with the power of her mind. I got the chance to try out a few more of her abilities, including Seize, the aforementioned mind control of weakened enemies after a short channel time (akin to Middle-earth: Shadow of War), and an oh-so-satisfying ground slam that absolutely pulverizes baddies thanks to Jesse's superhuman punches. Though more firing modes await in the final game, I got to put the recombobulating Service Weapon through its paces in the rapid-fire Spin and charged-shot Pierce modes. Call me Mr Brosnan, because I was Pierce all the way during my demo – its superpowered payload, which leaves a smouldering crater in anything or anyone it hits, has so much more oomph than the Spin's piddly damage and frequent reloads. Of course, the Spin might win me back thanks to the many weapon mods you can recover as you explore The Oldest House, which have intuitive benefits like buffed damage or shorter reload times. Jesse can also upgrade her own abilities using character mods, for everything from an increased health pool to the invaluable quick recharge of your power meter. You can acquire mods through a variety of means: Drops from defeated enemies, Item Containment Boxes (read: Chests), or even just finding them tucked away in some wrecked corner of the Federal Bureau of Control offices. Unfortunately, the enemies I was aiming the Service Weapon at simply weren't very engaging to fight. The mysterious force known as The Hiss has the Bureau's employees in its thrall, turning them into mindless drones – which basically translates to shooting at humans outfitted with varying degrees of armor and heavy weaponry. There were a few exceptions, like the Hiss Cluster, a translucent orb that buffs and heals your enemies (which you can use to your benefit if you Seize it). I was delighted – and disturbed – when some flying enemies were introduced in the form of human test subjects with sacks on their heads strapped to floating chairs, but taking them down didn't feel so different despite their skin-crawling appearance. 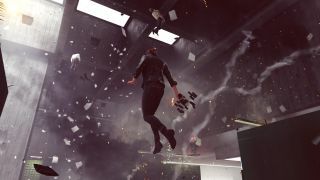 Still, with five months still to go until Control is due to launch there's plenty of time for Remedy to improve its AI systems in an effort to deliver more of a challenge. The sameness of the firefights could also have been an effect of this particular demo, where Jesse was massively overpowered and tricked out with all kinds of weapon and character mods. But Control employs a minor pet peeve of mine: An 'encounter director' that intermittently pits you against swarms of enemies that scale to your level, keeping you constantly occupied over the course of the game at the expense of authored battles. Instead of shootouts feeling like unique skirmishes built around memorable setpieces, all my battles started to blend together as I simply strafed around and shot whatever was closest until I was the only thing left standing. At one point during a hands-off section of the demo, Jesse came face-to-void with an Astral Spike, a fascinating enemy that pulsates and flickers erratically like a purposefully glitched model and sucked in debris like a physics tornado. This is exactly the kind of confusing, discomforting, borderline incomprehensible entity I want to take on in Control – but it was quickly neutralized by luring it back into containment via a simple cat-and-mouse maneuver. I'm hoping Control ends up taking a page from SCP Containment Breach, where strange new creatures are almost always a threat to your survival, but their terrifying methods aren't immediately made clear. Everything in The Oldest House looks hauntingly beautiful, from the museum-like main lobby built around a colossal tree, to the transforming art deco walls of the Mirror Maze that fold into themselves like interior decorating done by Doctor Strange. Control's combat effects build off the captivating time-warping light shows of Quantum Break, with defeated enemies exploding into an ethereal vapor, and The Hiss' corruption emitting a foreboding red glow that plays tricks on your eyes. But when things got particularly hectic onscreen – with a squad of enemies all attacking at once and Jesse flinging rubble every which way – the performance definitely takes a hit. I played Control on a PS4 Pro, but even Sony's premium console struggled to keep up with Control's effects-filled visual. "Last time we were on PlayStation was PlayStation 2 for Max Payne 2, so it's been a while," admits game director Mikael Kasurinen, who was also game director on the Xbox One and Windows exclusive Quantum Break. Control is targeting a steady 30fps, but the demo's frame rate seemed to dip rather frequently. And though Jesse can tear up concrete and send work desks flying every which way, any environmental destruction will eventually be wiped. "It's a bit of a technical challenge to wall off that memory to have that persistent information," Kasurinen tells us. "So the building heals; when you come back, it's what it used to be." At least with The Oldest House, that kind of transdimensional resetting makes perfect sense. "Last time we were on PlayStation was PlayStation 2 for Max Payne 2, so it's been a while"
There's also promise of some wildly different environment types, even though the entirety of Control theoretically takes place in the same one office deep below New York City. "There are no outdoor environments – everything's happening within the Oldest House," Kasurinen continues, noting that this should offer more than enough variety throughout Control's lengthy campaign. "But it's a vast, infinite space with a lot of things that can happen within it." I got a hint of what's to come with a quick visit to a bathroom overgrown by a coral-like moss, its lush greens and sickly yellows creating a striking contrast to all the grey concrete I'd seen elsewhere. But, for all the graphical splendor of Control's combat, the quieter moments after all of the fighting was over are what really captured my attention. Listening to unexplained reverberations echoing through the empty halls, gazing up at floating bodies dangling in the air like neglected puppets, perusing Bureau documents packed with redactions (including an explanation for the poor fridge watcher we encountered in our previous demo). Control feels like it'll hit a home run with players who favor unsettling atmosphere over intense action – more Alan Wake than Max Payne, but with Remedy's unique sense of style imbuing all of it. You can find out what awaits in Control when it comes to PS4, Xbox One, and PC on 27 August 2019. Speaking of Remedy's works, read up on the making of Alan Wake, which was almost an open-world Silent Hill.